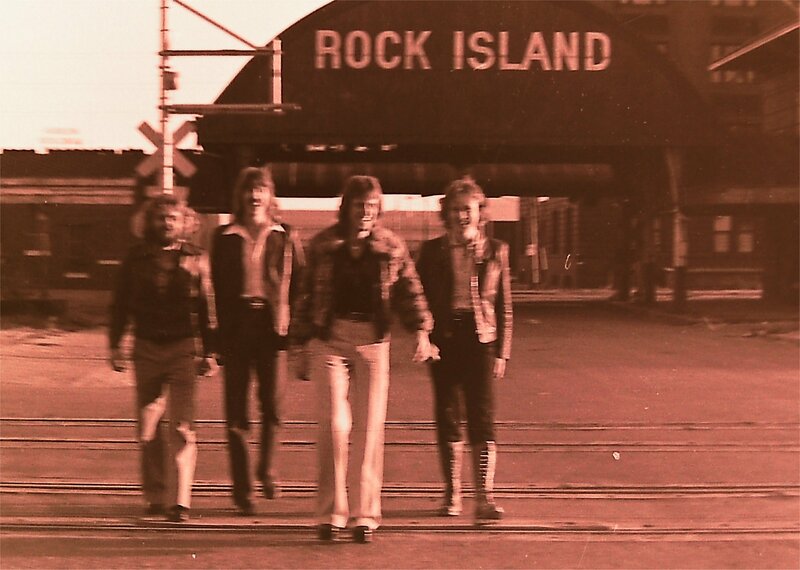 After all the times I have been saying the photos from the October 29th session in 1978 were taken in Rock Island, it turns out that is not correct. A couple of days ago I shot Art an e-mail with a question about one of the places on our October 1978 booking calendar called the Sundance Palace. Where was it? Art didn’t remember. He also didn’t remember where the Kongo Club was located (I think it was Sioux Falls, SD). However, he did suggest that the photo session I have been mistakenly attributing to one of the Quad Cities actually took place in Des Moines. As is shown in this very fuzzy out of focus picture, the awning clearly shows the name “Rock Island”. However, it probably refers to Rock Island Lines transport company and was taken at their old railway station in Des Moines, not Rock Island. Art also said the name of the young lady who loaned me her fuzzy coat for that session was Cheryl. He says we met her in Minneapolis at one of the places we were playing, but she was originally from Des Moines and moved back there after we met her. Yes, I did give her back her coat.